Provide comfort for the family of Domenica Nugai with a meaningful gesture of sympathy. Mrs. Domenica “Lena” Nugai, 97, a longtime resident of the Lakewood Section of Pittsfield, MA passed away Monday, March 25, 2019 at Sweet Brook Rehabilitation & Nursing Center in Williamstown, MA. She was born in West Stockbridge, MA on March 8, 1922 a daughter of the late Battista and Emma (Maule) Marchetto and moved to Pittsfield as a child. She attended Pittsfield schools and graduated from Pittsfield High School in 1939. Domenica was employed by the General Electric Co. from 1939 to 1944 and then by the Pittsfield School Dept. as a secretary at Williams Elementary School from 1952 until her retirement in 1982. She was a communicant of the former All Soul’s Church and member of the All Soul’s Church Ladies Society and former member of the Italian American Club. She enjoyed reading. Her husband, Enrico J. “Harry” Nugai died on April 3, 1995 and they were married on October 2, 1943. Survivors include her son, Ronald J. Nugai of Pittsfield; her grandson, Michael P. Nugai and several nieces and nephews. She was predeceased by her brother, Anthony J. Marchetto and daughter-in-law, Cheryl A. Nugai. Funeral Notice: Funeral Services will take place Monday, April 1, 2019 at 10:00 A.M. at the FLYNN & DAGNOLI-BENCIVENGA FUNERAL HOME, 5 Elm St., Pittsfield, MA 01201 with the Rev. Monsignor Michael A. Shershanovich, Pastor of St. Joseph’s Church officiating. Burial will follow in St. Joseph's Cemetery. Calling Hours will be Monday from 9:00 A.M. to the time of the service. To add to the Book of Memories, please visit www.flynndagnolifuneralhomes.com. To send flowers in memory of Domenica "Lena" Nugai (Marchetto), please visit our Heartfelt Sympathies Store. We encourage you to share your most beloved memories of Domenica here, so that the family and other loved ones can always see it. You can upload cherished photographs, or share your favorite stories, and can even comment on those shared by others. 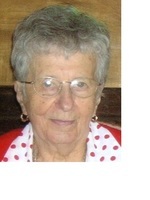 Provide comfort for the family of Domenica "Lena" Nugai (Marchetto) by sending flowers. May the family of Domenica Nugai please accept my sincere condolences hoping you find comfort in God's words at Acts 24 : 15 and Psalm 37 : 29.